An 18-year-old man, who was found by the Children's Court to have falsely imprisoned former tánaiste Joan Burton and her adviser in Jobstown in Tallaght three years ago, has won his appeal, after lawyers for the State said they would not be contesting the case. Jason Lester, from Brookview Close in Tallaght, said the last two years had been extremely stressful for him and had taken a toll on his health and family life. A judge at the Children's Court in 2016, ruled he was entitled to make a finding of guilty in the case against Mr Lester, who was 15 at the time, of falsely imprisoning Ms Burton and her adviser Karen O'Connell, during a protests against water charges in 2014. The judge said he would leave the young man without a criminal conviction if he was of good behaviour for nine months. However, Mr Lester and his lawyers appealed the Children's Court ruling to the Circuit Court. In a brief hearing this morning, lawyers for the State said they would not be contesting the appeal. Judge Patrick Quinn said he would allow the appeal and set aside the order of the Children's Court. 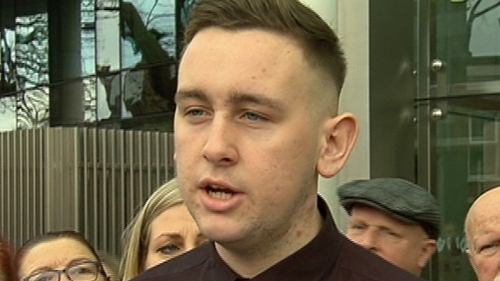 Speaking outside court, Mr Lester said he had been prosecuted for the serious offences of false imprisonment when he was only 15 and taking part in a legitimate political protest. He said he had always maintained his innocence and had been exonerated today. He thanked his family and legal team. Earlier this year, six men were found not guilty after a trial at the Circuit Criminal court of falsely imprisoning the two women during the protests at the An Cosán Centre in Jobstown on 15 November 2014. Charges against a seventh man had been dropped earlier in the trial. The State then dropped charges against a further ten people who were due to go on trial in connection with the incident. One remaining man pleaded guilty to criminal damage to a garda car and will be sentenced next year. Solidarity TD Paul Murphy, who was one of the men found not guilty earlier this year, also spoke outside court and renewed his call for an independent investigation into the prosecutions and the behaviour of gardaí.